If you’re not that great at reading, the short answer to the question is “for creating 3-dimensional marketing pieces”. At this point some people will think “Ok, cool. We don’t do anything 3-dimensional, only digital.” The same people use brown boxes to send stuff out. We’ll it’s not marketing is it? Enough said. 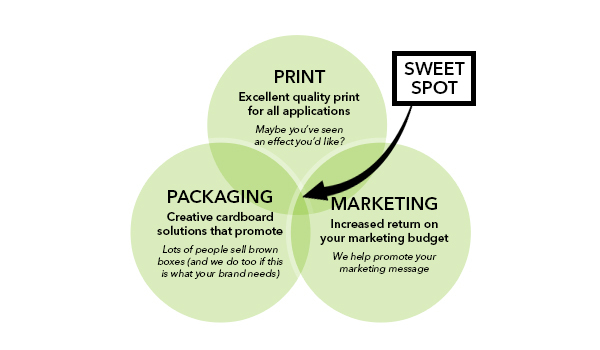 Our sweet spot comprises of Print, Packaging and Marketing experience. This is at the grass routes of everything we do here, playing a smaller but still vital role. Excellent quality print for all applications means we’ll advise you on what’s best for your brand and your project – from Litho to laminate, Digi-print to dogtooth, Flood-coat to flexo. Maybe you’ve seen an effect you’d like? When we say Packaging, we don’t just mean a warehouse full of brown boxes and bubble wrap. We mean mostly Creative and mostly Cardboard solutions that promote. It’s what we eat, drink, and breathe here. It’s probably the top reason why we don’t sell boring boxes, because everyone who works here has a role in Marketing. Part of this sweet spot, is that we’re as concerned as your CFO that there’s a return on the marketing you do. Believe us, good marketing is great for organisations. Without it, they don’t survive. We’ll try to promote your marketing message in everything we produce for your brand. Where else can you find advice on print, packaging and marketing in one place?